The full-bodied and powerful tone of this Guild dreadnought provides guitarists with a classic acoustic sound and balanced voicing. 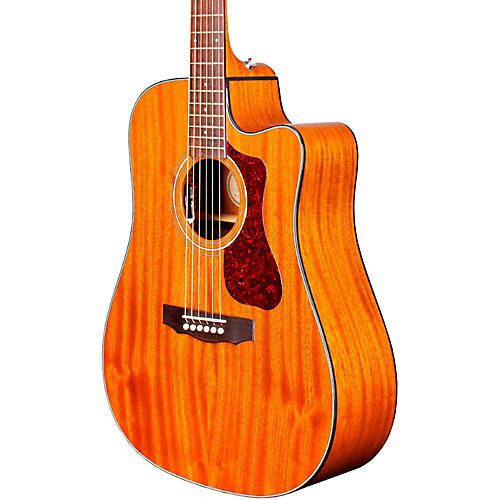 Built with solid African mahogany top, back and sides, the D-120CE also features an elegant cutaway for access to higher frets, and a hidden Fishman Sonitone pickup. Additional features include an Indian rosewood fingerboard and bridge, NuBone nut and saddle, and period-correct tortoiseshell pickguard. A mother-of-pearl rosette and Guild' iconic Chesterfield headstock emblem reminiscent of 1960s models complete the package. 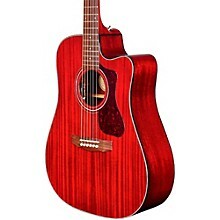 The D-120CE includes Guild' new lightweight polyfoam case and is available in Natural or Cherry Red gloss finish.